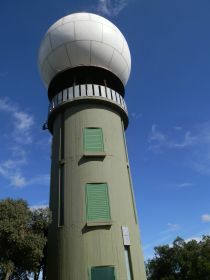 The highest point on the Gavarres hills is at Puig d'Arques (535m) marked by a tower with a large white dome on top. The dome is visible from miles away and we always thought it was an observatory from a distance. The peak itself sits in the very heart of the Gavarres and is quite remote from other towns or villages. This means there are a variety of places we could start the walk - Calonge, La Bisbal or, as we chose Romanya de la Selva - it's about 7-8km from Romanya. Because of the relatively remoteness and because other places on top of the Gavarres are only accessible on gravel tracks we didn't want to try to get closer without knowing what the roads would be like. As it happens, there is a tarmacked road to Puig d'Arques which we took as our route back, but we didn't know this beforehand and experience of roads in remote areas disappearing into a pitted track meant we didn't want to take the risk. So starting at Romanya, rather than trying to get closer seems a good bet. The disadvantage was not so much the distance but we couldn't tell how easy it would be to make a round trip. In the end we took the marked GR92.1 (one of the extensions off the coastal GR92) out and the road back, but there is a path on the maps which descends into Vall Repos as a possible alternative route back. Again, not knowing the area so well we were a little cautious and stuck to an easy route. We've covered Romanya de la Selva. This time we didn't visit the village itself but headed straight out. 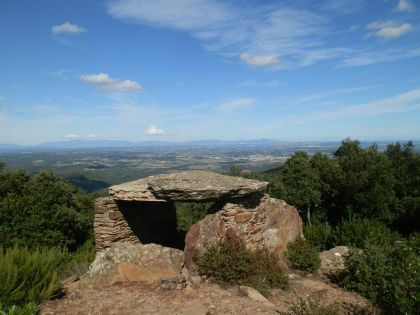 The GR92 starts past the cross and then follows the road to Calonge for a little way, on past the roadway to Puig d'Arques, past the cemetary and close to the Cova de Daina - a small neolithic burial chamber - turning to the left and following a track into the woods. As we entered, there were signs up warning of hunters looking to shoot wild boar in among the woods. Often the hunters bring dogs too, mainly two or three for tracking, and occasionally you will hear the whistles and barking in amongst the trees. The hunters weren't the only people out. October is the start of mushroom season and mushroom hunting is a very popular weekend activity in the hills of Catalonia. We also passed a number of chestnut trees (Castanyas) and they're also nearly ready for collecting - a treat for halloween and the end of October. The path runs through the woods with a deep valley (Vall Repos) to the right and the occasional view of the sea. It's a gentle upwards climb, but not particularly steeps and down in the valley we can see scattered isolated masias in among the trees. The path continues for a while. It's clear blue sky, but fresh enough to walk, though just in a t-shirt with a definite coolness as we curl around the shadier side of the hill. The track's wide enough for 3 or 4 people side by side, but no more, so we're a little surprised to see car tracks and cars parked in the woods as the mushroom hunters scurry around under the trees. Eventually the path curls around to meet the roadway up to Puig d'Arques. As mentioned, we weren't sure what quality of road this was, but it turns out that though narrow and quiet, it looks relatively recently updated and in good condition. 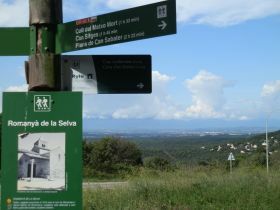 The road itself runs along the first of the hill ridges giving views down the valley to the sea, or on the otherside out across the hills towards Cassa de la Selva and Montseny in the distance. On the ridge itself is a farmhouse in the process of renovation and fields of sunflowers past their best. We're also not the only ones visiting and we see other walkers, cyclists and the odd car heading to or from Puig d'Arques. Eventually we reach a crossroads. The road itself curls up to the right while we take the left hand path to Col de la Moixa, back into the woods again. This path climbs more vigorously with views out towards the Pyrenees through the trees. We're surprised to pass an inhabited house just off the path - it looks like the track we're on would be their access road but it barely seems wide-enough through the trees. Another junction and we continue to follow the signpost to Puig d'Arques passing under the occasional chestnut tree with the first prickly castanya shells on the floor, but looking like boars might have taken the contents. Onwards and upwards and we get to a choice - Puig de Gavarres, or Puig d'Arques. The sign post says Puig de Gavarres is just a little higher than Puig d'Arques, but we continue to the tower at Puig d'Arques where it says the reverse. The tower with the dome on top looks more like an observation post - it doesn't look like an observatory from close up, and the tower itself is closed, but next door is a viewing platform and the views are immense - almost a 270 degree panaroma across the Emporda region - and we wish we'd taken binoculars up. For the return journey we head down and find the road. 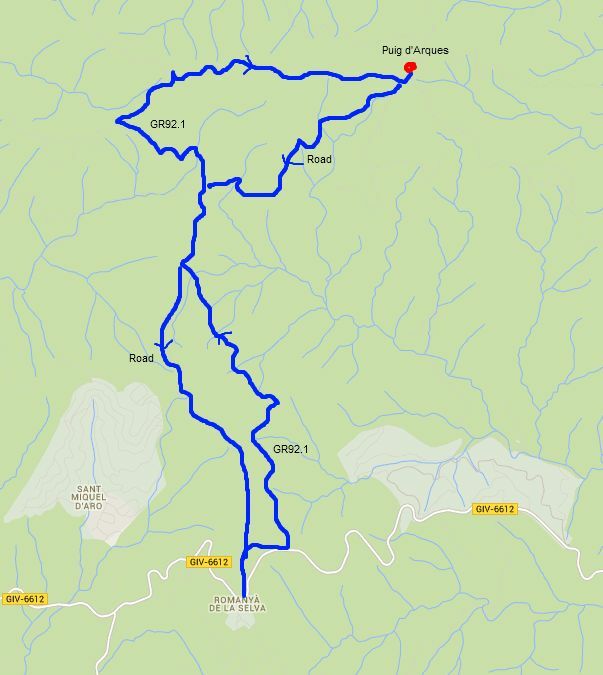 There's the option of going down to Vall Repos, but we've already done 7km and the children don't want to have a diversionary explore into Vall Repos, so instead we take the easy way down and follow the tarmacked road still remarking at how deep the valley seems to our left. 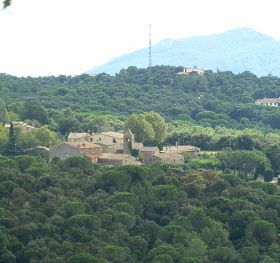 At the lower point we could go back on the GR92 track, but we stay on the road and get the treat of views across Sant Miquel d'Aro and across the valley to Romanya de la Selva. Otherwise it's straightforward and we get back, past the cross that we started at.